When we write, our initial tendency is to write for ourselves. “Write what you like to read.” We hear it all the time, we see it on nearly every writers’ blog out there, and we’ve even said it ourselves. It’s important to write what you like to read since it means that you’ll probably do a better job at it. It’s also somewhat reasonable to believe that if you like to read it that someone else out there might like to as well. The problem is that, as writers, when we write for ourselves, we run the risk of not staying reader-focused. We forget that telling the story really isn’t about us, but the reader. 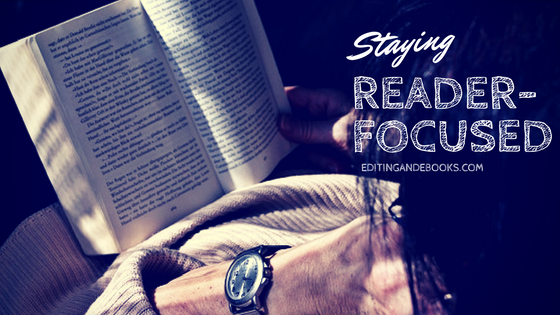 Not staying reader-focused is one of the most common mistakes that we see when we edit novels. So, today, let’s talk about three easy ways to avoid this pitfall. #1. Use character sketches to be sure that you are showing your characters to the reader. While there is a school of thought that says you should not describe your character to the reader, we tend to disagree with this since it really helps readers create the story in their minds when they have a more detailed image. At the least, your reader needs to have a general idea of what your characters look like. To be sure this happens, YOU have to see the character and keep that image consistent as you write. In other words, Bob can’t have brown hair and blue eyes in one chapter and red hair and green eyes in the next (unless he’s in disguise or you’ve explained it some other way). The easiest way to do this is to sketch out what your characters are like (both physically and personality-wise) before you write. Then you use this to include details about your characters for the reader in the story. Another plus from doing this is that you also stay consistent, thus creating narrator reliability and trust. This same mistake of not using enough detail or being inconsistent happens when describing setting as well, so you can do a similar exercise with your settings and use those to help you as you include that element of your story. #2. Add movement to your dialogue. So many times, writers create a scene in their minds, but they fail to paint that on the page for the reader. And the time this happens most often is in dialogue. One of the worst things that a writer can do is have page after page of dialogue with absolutely no movement in the scene. In real life, movement happens. We take a deep breath. The wind blows. We brush our hair aside. Leaves fall at our feet, and we watch its path and then reach out with our foot and brush it aside before we walk on. We don’t simply talk to the whole time. And we certainly don’t stand in one place with our hands by our sides while absolutely nothing happens in the world around us. By adding in movement and keeping the current scene moving, you progress the action in the story, build characterization, and really bring the story to life for the reader. Our rule of thumb is: If a piece of dialogue is over five lines long, then it needs to be broken up. Add in movement. Let someone else speak. Address the current scene and what is going on. Most importantly, bring the scene to life for the reader and let the reader see what is happening in the scene. #3. Always revise with the reader in mind. To do this, you have to take time away from the story. This is truly the most important step in the revision process. Take a break. Walk away. Lay it down and don’t pick it up for at least one week… but preferably two. Then come back to it and read it. As you do, stay focused on what the words say to the reader who hasn’t read (or written) this piece. When you do this, it will become clearer and clearer where you’ve left out details, where you’ve been inconsistent, where your scene gets lost in dialogue, and much, much more. By using these three little tips, you can improve your story dramatically for the reader. And, after all, it’s the reader who is going to be buying, talking about, and helping you sell your book based on their opinion of what they’ve read. When you think of it that way, it’s truly worth the effort to make staying reader-focused a priority when you write.